Dear readers – welcome to the first post on the blog of The Marion E. Wade Center. We hope to use this site to share more information with you about who we are, what we do, and also offer some in-depth looks at our collections. This month will start a series of posts we are simply calling our “artifact of the month,” when we choose one item per month to feature from the Wade’s vast holding of materials. 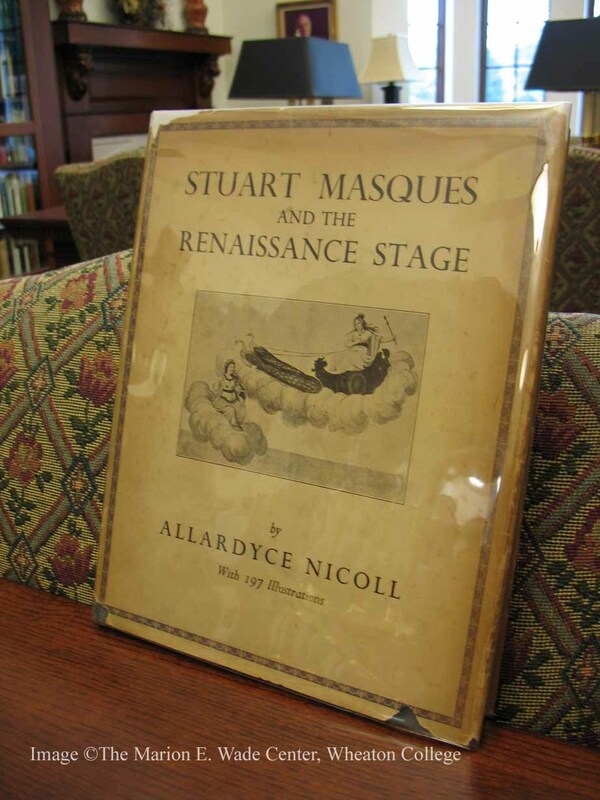 The June artifact of the month is the book Stuart Masques and the Renaissance Stage, which is from the personal library of Dorothy L. Sayers. 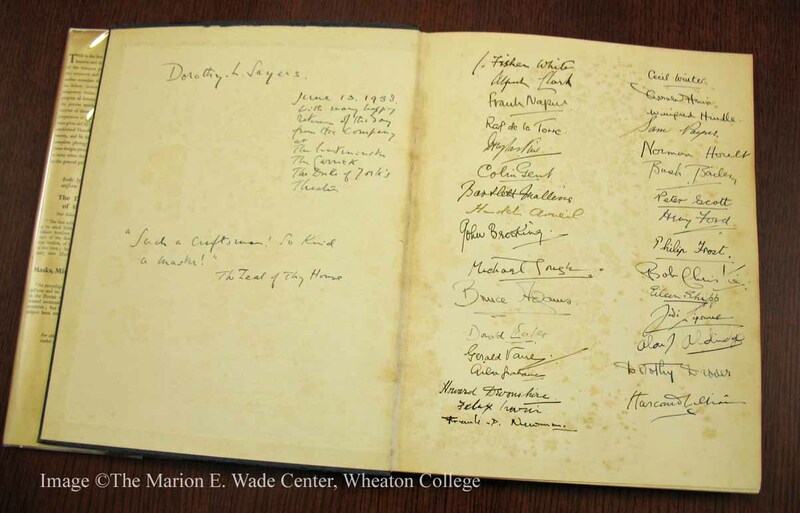 The Wade Center owns books from the personal libraries of all seven of our authors, and Sayers has one of the larger collections with around 219 volumes. C.S. Lewis’s library takes the prize, however, with 2,491 volumes. This book has a very interesting history; it was personally signed as a birthday present (given June 13, 1938) to Sayers from the cast members in her religious drama Zeal of Thy House, written for the Festival of the Friends of Canterbury Cathedral in 1937. The invitation for Sayers to write the play came in 1936 from Margaret Babington, the Canterbury Festival organizer, at the suggestion of Charles Williams, who was already an admirer of Sayers’s work. The subject of the drama focuses on the story of William of Sens, the architect appointed to rebuild the Choir of Canterbury Cathedral in the 12th century. The play’s first performance was on June 12, 1937 in the Chapter House of Canterbury Cathedral, and went on to have other performances in the late 1930s. The actors who signed this book were from the Westminster, Garrick and Duke of York’s theaters on the Zeal tour. Zeal was published in 1937 by H.J. Goulden in a slightly shortened acting edition, and then in a full trade edition by Victor Gollancz that same year. 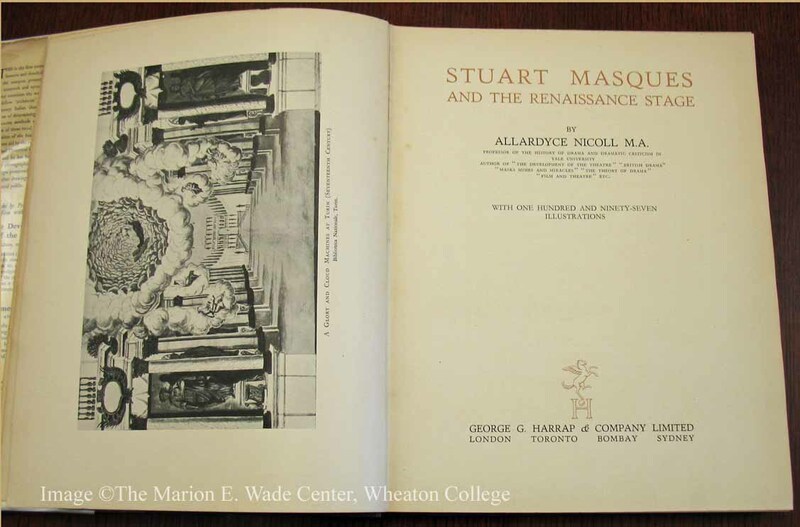 Stuart Masques and the Renaissance Stage arrived at the Wade Center with other related materials from a Sotheby’s 2000 auction in London. More information about Sayers’s play can be found in the Wade’s Zeal of Thy House archive. 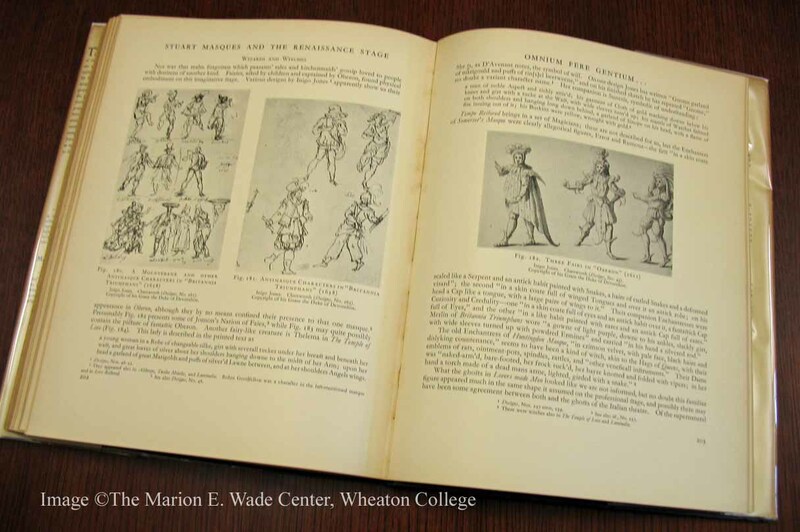 There is also a current museum display at the Wade Center about the Canterbury Festival Plays, so drop by and see it in person. June 13, 2014 marks the 121st birthday of Dorothy L. Sayers, and the 100th birthday of her friend and colleague, Barbara Reynolds, recipient of the Wade Center’s 1st Kilby Lifetime Achievement Award in 2007. Dr. Reynolds will be celebrating her birthday with members of the Dorothy L. Sayers Society (of which she is President) in England, and the Wade Center sends our very best wishes to her. Title page from STUART MASQUES AND THE RENAISSANCE STAGE. All images are owned by the Marion E. Wade Center and may not be used without permission.